Durée (?) 3h 30 min. 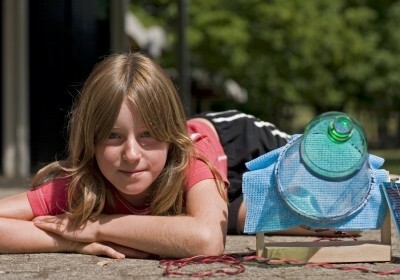 This DIYs project shows how to build an "ecological air conditioning system". The electricity of the fan is generated by a photovoltaic cell and the air is cooled simply by evaporating water. Conventional air conditioners are very energy consuming. They work like a fridge and need a lot of electricity to compress a gas inside a closed circuit. Another solution which uses far less energy is to evaporate water to cool the air. When evaporating, water removes heat from the surrounding air which then gets cooler. This principle is already used to cool buildings in a more environmentally friendly way (adiabatic cooling). The efficiency of this system varies depending on the humidity of the outdoor air and should be used in very well designed buildings (well insulated with good sun protections for example). Form a cone and staple it. Form a cylinder and stapple it.